In addition to wowing us with a heartbreaking 120,000-piece model of the Titanic breaking in two, Ryan McNaught also spent the month of December building an incredibly-detailed model of an Air France Concorde that reveals all of the supersonic plane’s inner workings and details. 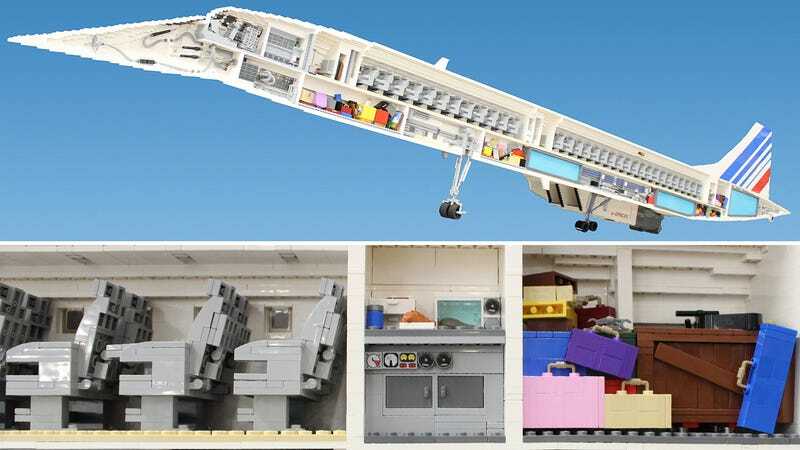 On the right side, McNaught’s 13-foot long Concorde is a near flawless replica of what was once the flagship of Air France’s fleet, perfectly capturing the jet’s curves through some intricate Lego layering. But move around to the left side and you’ll discover that the model is also a cutaway, revealing where the Concorde stored fuel, cargo, and the passengers willing to pony up thousands for a supersonic trip across the Atlantic. If you look closely, the inclusion of a croissant in the Concorde’s rear galley is a nice touch given the half-French origins of the aircraft. But seeing how few seats they managed to cram inside the plane is a good indication of why the Boeing 747 was able to put an early end to the Concorde’s career.